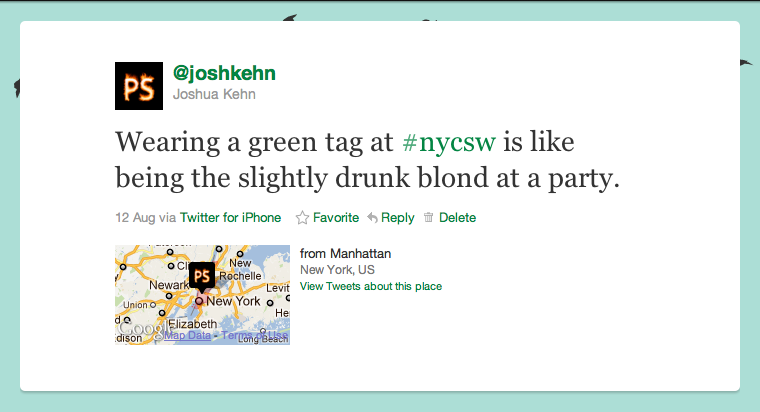 I’m participating in Startup Weekend in New York City on the recommendation of a few friends. The networking has been more enjoyable then the idea pitches, though I’m getting hit on more then most. The developer / business ratio is off by a fair margin. Good for picky developers, bad for people trying to attract much needed developers to their team. I know of at least one team that couldn’t attract any developers. Notes I took are available either in interactive HTML format, plain text, or the original OmniOutliner 3 document.